Contact Republic Services Customer Service. Republic Services delivers the container and bills directly for the service. Generally, paper, cardboard, plastic, aluminum/metal, and glass. For a more detailed list, as well as non-recyclable and special handling items click here to view a brochure from Republic. Recycling days and schedules are maintained by Republic Services. Please see the detailed map linked below. Pickup days are determined by your location and the week of the month. 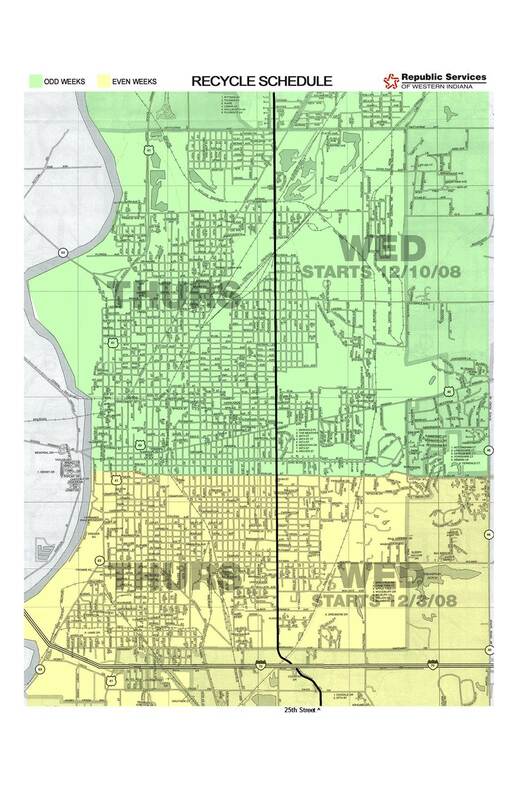 Generally, the city of Terre Haute is devised into 1/4ths. The dividing lines are Poplar St and 25th Street. Odd weeks are 1st, 3rd, and 5th of the month. Even weeks are 2nd, and 4th of the month. Here are the pickup dates. North of Poplar AND east of 25th - Wednesdays on the odd weeks of the month. North of Poplar AND west of 25th - Thursdays on odd weeks of the month. South of Poplar AND east of 25th - Wednesdays on even weeks of the month. South of Poplar AND west of 25th - Thursdays on even weeks of the month. If you have any questions see the map or contact Republic Services.